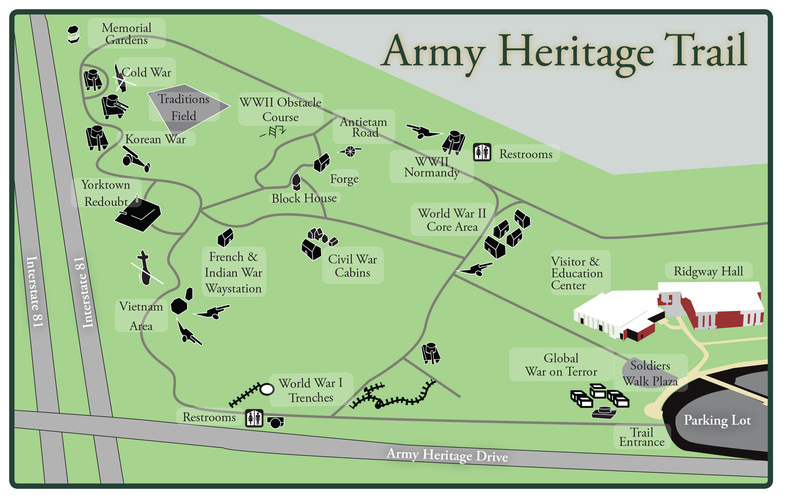 The Army Heritage Trail serves as the USAHEC's outdoor museum. It encompasses the grounds of the USAHEC, covering about one mile and highlights nearly every era of Army history with different exhibits and large artifacts. Designed to provide an immersion experience that allows the visitor to walk into each period represented, the Trail also serves as a stage for living history presentations by historians serving as interpreters. Fourteen individual exhibits include full scale reconstructions of a French and Indian War way station, Redoubt Number 10 from the Revolutionary War siege of Yorktown, a section of the Antietam battlefield, a Civil War winter encampment with cabins, a WWI trench system, a WWII company area, a replicated Normandy Bocage scene from World War II, a Current Operations HESCO Bastion barrier checkpoint, and an interpretation of the Vietnam helicopter air assault at Ia Drang that includes a period Fire Support Base. Additionally, there are numerous smaller exhibits featuring armor, aircraft, and artillery from several different eras of U.S. Army history. 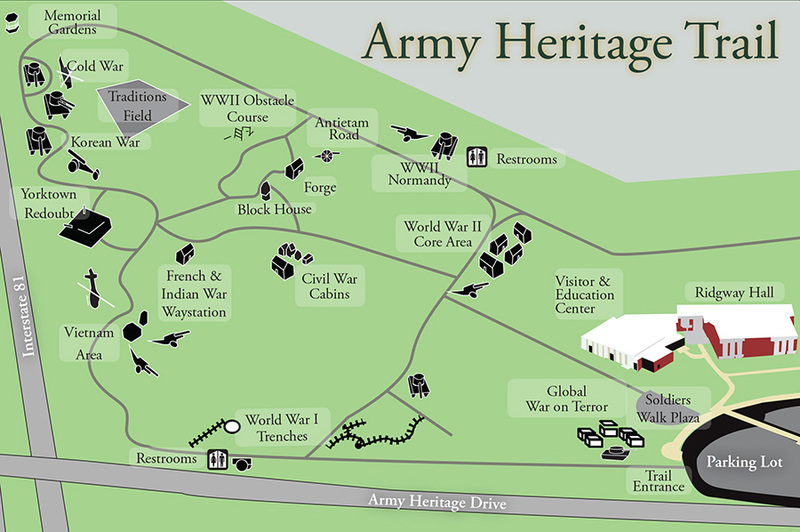 The Army Heritage Trail is open for visitation dawn to dusk daily and is under security surveillance. The buildings and structures on the trail are open during normal hours of operation, weather permitting. Dogs are welcome on the Trail, but must be on a leash at all times, and owners must pick up after their animals. Visitors are invited to walk, run or ride bicycles along the trail, but private motor vehicles are prohibited. WWI Trenches Hellcat Tank Destroyer French & Indian War Waystation Korean War Cold War Traditions Field Revolutionary War Blockhouse Civil War Cabins UH-1 Iroquois "Huey"